Benita at Victoriana Quilt Designs invited me to participate in Quilters' Meet and Greet which begins today, September 4. This may be your first visit to my blog or you may have read previous posts. They are usually posted on Mondays and included in a number of link ups. My blog is a chronicle of my quilts as well as other events I'd like to record -- traveling, book reviews, and some social commentary. Click HERE to link to the Meet & Greet page. My volunteer work keeps me connected locally, at the state level, and beyond: AAUW, Rotary, P.E.O., GFWC-Zion Woman's Club, Coalition for Healthy Communities, church, and quilt guild. If I take notes I pay attention during meetings, so I volunteer to be secretary (six organizations right now). I read Robert Putnam's Bowling Alone when it was a scholarly article (before the book became a best seller). I believe that each of us should do our part to invest in and build social capital. Links to the organizations are on the blog side bar if you want to learn more about any of them. She used a kit to make an appliqued pansy quilt for my 11th birthday. I have the quilt but right now I can't find a photo. I made my first quilt in 1973-74 when I was in graduate school.. It's a Bucilla cross-stitch kit, double-bed sized. I did the cross stitch first semester and the hand quilting the second semester. I used it as a bedspread until I got married (and moved to a king-sized bed). Both the quilt and the degree have served me well. Through the 1970's and 80's I appreciated quilts but I didn't make them. In the small Texas city (my first library) a blue-ribbon-winning local quilt maker set up a class. I chose a pattern from Family Circle magazine -- mariner's compass in red and green. I did not get farther than purchasing the fabric and cutting cardboard templates. I abandoned the class. During those years I made most of my clothing. That was the heyday of needlepoint and I did a lot of it, mostly pillows. As cross stitch came into vogue I dabbled in that. About 1991 I checked out a quilt book from the library and learned that machine piecing was not only possible, but it was also acceptable. The rotary cutter had been invented. Template-free quiltmaking! I was hooked. This pink and green Card Trick is likely the first quilt I made with rotary cutter and machine piecing. It looks so bland! VIP still makes this paisley print. I detest it. :) My notes on the snapshot are that I tore, rather than cut, the sateen-weave fabric for the sashes and borders so there were lots of ravels. I machine quilted it. I gave it away or sold it long, long ago. Storm at Sea with a heart was the cover quilt of the first issue of American Patchwork and Quilting in 1994. I didn't have a quilt fabric stash to speak of so I bought all the fabric at a quilt shop in Windham, Maine. I didn't know this is supposed to be a hard block. I just plugged away! My quiltmaking really took off in the mid-1990's. The first email service my library used (I was at Fargo PL then) included Usenet Nnewsgroups, among them rec.crafts.textiles.quilting. My dear Magpie friends are RCTQ alumnae. There's an RCTQ FB group, too, and many of us go back to the Usenet days. Here are a few of my recent favorite quilts. Click on the link to read more about them. This is the same block as the Stars in Her Crown, below, but I split the backgrounds for more interest. early member of the P.E.O. Sisterhood. The P.E.O. badge is a gold star. In 1870 she was photographed wearing her badge on a hair ribbon -- hence "Stars in Her Crown." Thanks for visiting! I hope you'll add my blog to your blogroll. HERE is the link to enter the Grand Prize contest. You have quite the journey! VIP paisley?? I love paisley. Such a history of quilting on one page. I know that some styles come and go but quilts will always be loved and cherished, no matter the genre of the day. 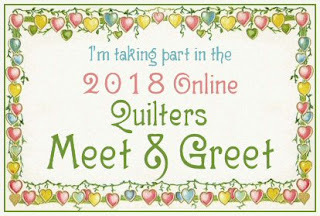 What a wonderful quilting journey - nice to meet you! I so love your cross-stitch quilt - what a wonderful creation...all your patience to create that beauty! Your work is lovely...I am so glad you are sharing it!!! Nann, it is nice to meet you again. Love your work but I am particularly fond of the "Scrappy with a chance of nine-patches" because it is wild and whimsical!!! Love your Forecast quilt! So colorful! Beautiful quilts! You certainly weren't afraid to tackle difficult patterns!! You go, girl!! I've wanted to make a few of the quilts you've shown, especially Storm At Sea, but haven't taken them on. Yours are amazing and so beautiful...thanks for sharing! It's been a pleasure to meet you, Nann. Your quilts are beautiful. Hey, Nann!! I recall that magazine issue that you mentioned. LOVE your Storm at Sea! See you over on So Scrappy for the Rainbow Scrap Challenge, if you are still following along. It was a pleasure to meet you! The Stars in Her Crown quilt is beautiful! The colors in it glow! Lovely quilts, nice to meet you. I started with that same exact Storm at Sea! I didn't know it was hard either. Some day I may go back and requilt it or do something to fix it. I enjoyed seeing this introduction! Looks like you got back in Mariner's Compass blocks - yay! So much wonderful information about early quilting. Thanks for helping me 'get to know you'. 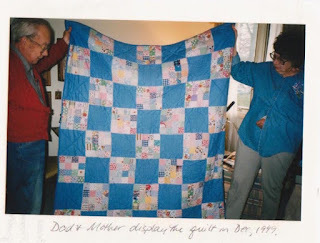 Wow, you are quilting for a long time ago ;) Great post, thank you for sharing. I love your Storm at sea! You have quite a history--your Mariner's Compass quilts are great! Great quilts and wonderful story! My favorite is the Storm at Sea with Heart. Thank you for sharing! I enjoyed your story immensely. We are probably close in age as I finished my course work for my bachelor's degree in December 1973. I haven't looked at any of the paperwork and it's probably offically dated May 1974 as the ceremony was not until then. I just blazed through in 3 1/2 years to get out of there. I didn't start my masters until 1981 and finished in 1998, yes that's right. I started on in 1999 because I was still searching for answers and the next thing I knew I was in a PhD program. I got very sick and just could not take more course work. I was two classes and my dissy away from that. Oh, well. My masters and my PhD work were not in my line of work. They were in education and gifted ed and I worked in Information Technology. I have two gifted children and one has never been able to find his way to a career of much substance. I took a sewing machine to school when I was a freshman during final week to help sooth the nerves much as you had your bedspread during your graduate work. I am amazed at your career, your organizations, and your quilts. You are an amazing lady. I love your quilts and enjoyed the stories behind them. I loved the story of your mother and uncle sewing. The Storm of Sea is still a quilt that I would like to tackle. I think being a math major, it might be of interest to me. I think if I take my time and cut carefully and trim my blocks, it may not be too bad. Thanks for a great adventure in visiting you. Such color, I love the quilt full of color. Love your Storm at Sea quilt with the red heart! Stopping by from the Meet and Greet ~ nice to meet you! Nann, I really enjoyed reading about your quilting journey. I think it's fun to see how your choices of colors, fabric, and patterns has evolved over time - and isn't that true for all of us?! Scrapppy With a Chance of Nine Patches really caught my eye! Wow. So many beautiful quilts and such an interesting quilting journey! Thanks so much for sharing with us, Nann! Great Post! Thank you for sharing..so much I sure didn't know.. great history info! My BFF is a Librarian at a grade school, and a Quilter as well. How fun! It's so much fun to read just how everyone got started. There are many of us I'm sure that started with those Bucilla cross stitch kits. I know I did. You sure jumped into the fire full speed with your Storm at Sea and have continued with those gorgeous NY Beauties. And what a blast to the past...Sugar Crisps. I haven't had them in years! LOL!! I love your Forecast: Scrappy.... quilt. The more color the better I like them. And the railroad themed quilt really touches my heart as I've lived in a RR community nearly all my life. Brings back many wonderful memories. Love the stores behind all your quilts. Thanks for sharing. Lovely post. good to meet you online. I do loads of hand stitching too! I enjoyed looking at your quilts and other projects and hearing how they came about. What a fun quilting and life journey!! and the quilts - I love how yours document the times you were in - they are all so lovely! What fun to learn more about yoU! 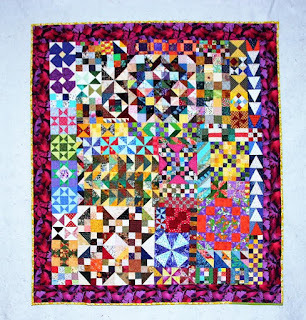 Such an amazing quilting history Nann, just wonderful! 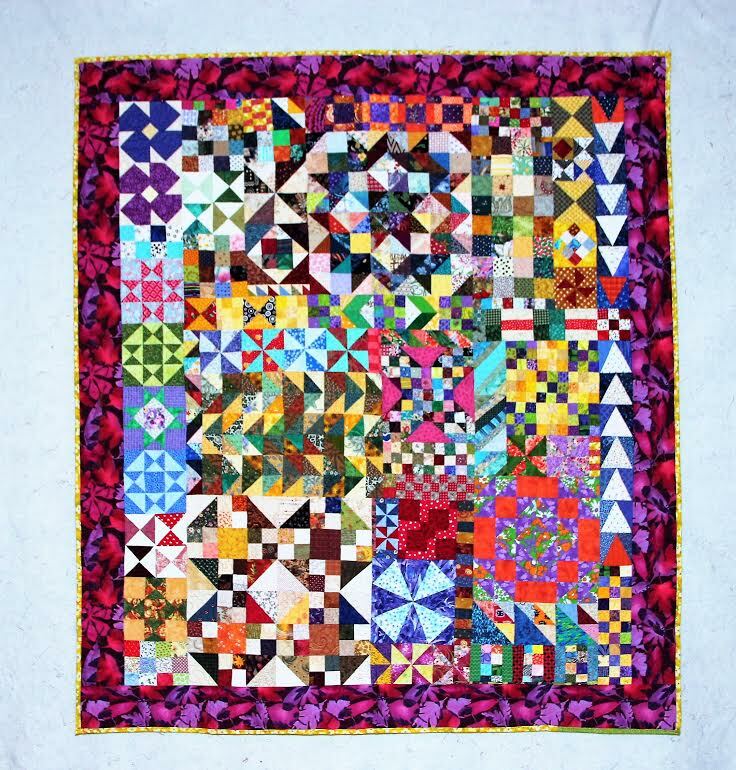 I love the Forecast scrappy quilt, it's so much fun. It was so much fun to read about your quilting journey. It is great that you have photos of your first projects. It's always nice to see the growth. Loved reading your blog about your journey into quilting. I was impressed that for your first class you chose the Mariner's Compass. I have always wanted to do this pattern but have so many other projects going, it is on my 'to do' list. Thanks again for the lovely journey. You have had quite the quilt journey! Love that scrappy quilt! Thanks for sharing! It was lovely to read about your quilting journey. I'm sure there are many more beautiful quilts in your future! 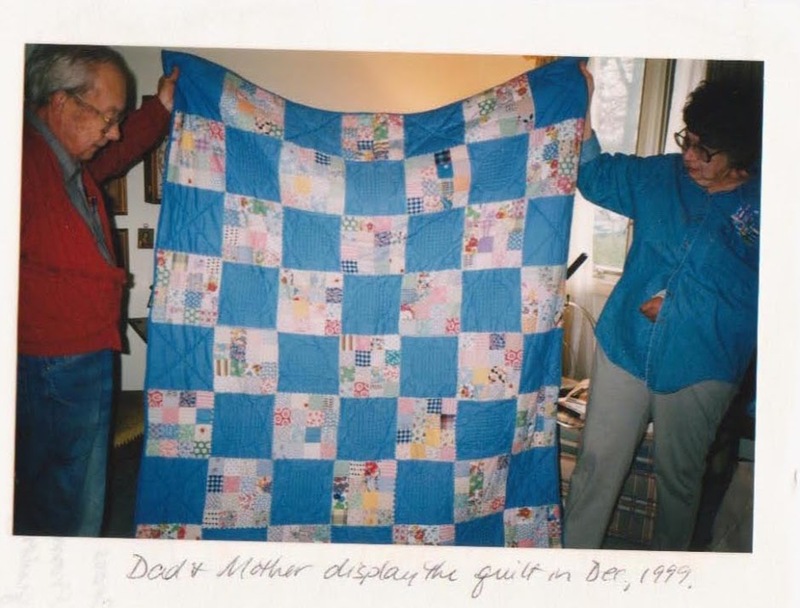 A wonderful story of your quilting, and what a treasure the quilt your Mum and Uncle made. But my favourite is the Storm at Sea, and a great way to have a heart there. I enjoyed my visit here with you. My background in quilting (albeit I'm more of a crazy quilter and just making a foray into landscapes) came from my grandmothers too. I really enjoyed reading your quilting journey. I really love the quilt with the orphan blocks. I have TONS of orphan blocks! Great work. Hi, Nann. I've met you at several ALA and PLA conferences for quilt show/shop side trips. I've done one Storm at Sea for a grandson and have another rainbow version in progress using Deb Tucker rulers. Always fun to see what you've got going. It's been interesting to read your quilting journey - lovely to meet you! What a fun post! Your journey has been long and constantly evolving. It is really cool to look at your early projects as compared to your current ones. Wow! !